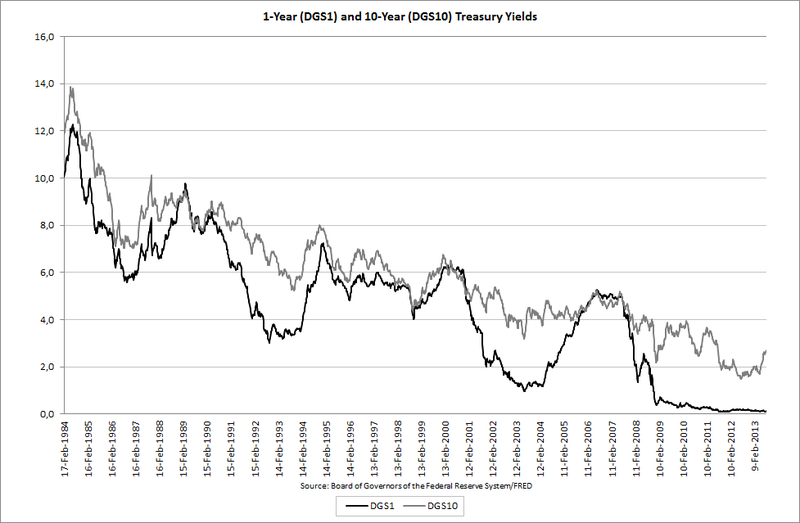 After Bernanke first discussed tapering with Congress in late May this year, the 10-year treasury yield increased by 57 basis points, or 26.6%, from 31 May to 14 August. 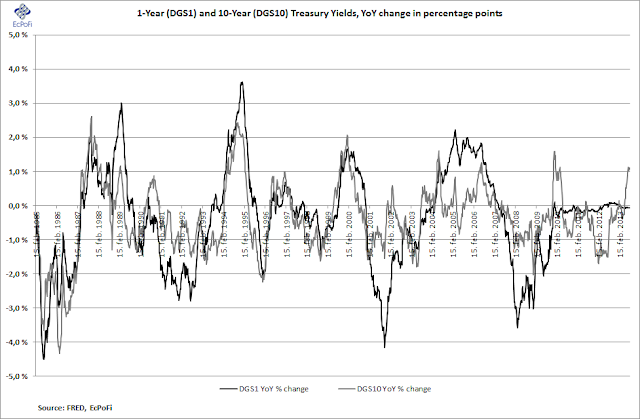 With the Fed being the marginal buyer of longer-term treasuries, it's no surprise the yield has risen sharply as a result of the tapering talk. And it should hence come as no surprise when interest rates continue to move upwards if "the outlook for the labor market has improved substantially in a context of price stability". It is however difficult to picture the Fed reducing their asset purchases, certainly significantly, as long as the U.S. is running huge budget deficits as rolling over debt will become very expensive when interest rates rise as a result. U.S. banks currently sit on more than USD 2 trillion in excess reserves, enough to cover USD 85 billion a month for almost two years should the Fed end QE all together. 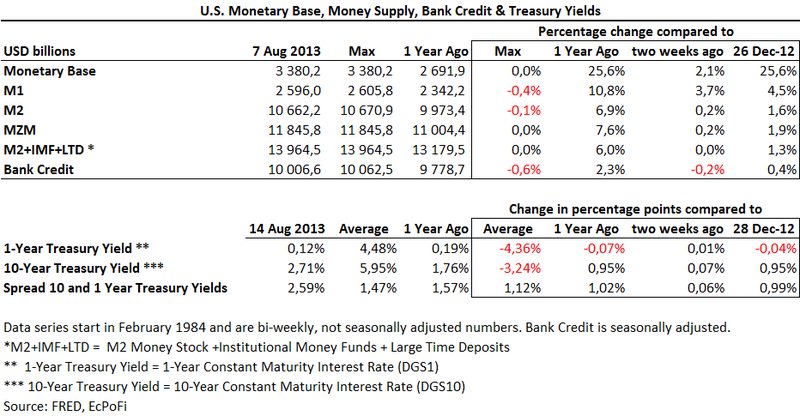 As many of the larger banks are primary dealers, they are required to buy treasury securities from the U.S. Treasury. During QE, the banks have just sold these on to the Fed. 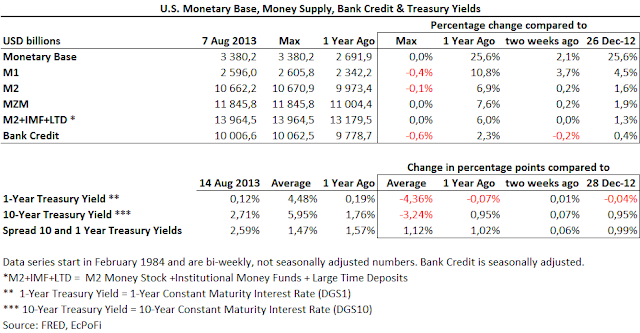 If QE ends, banks that are primary dealers will therefore require cash reserves to buy newly issued treasuries. This could very well be one of the reasons banks on average are just sitting on this pile of excess cash instead of expanding credit (i.e. lending it out). If that is indeed the case, expectations of future increases in money supply should be lower and increases in interest rates higher than they otherwise would have been. 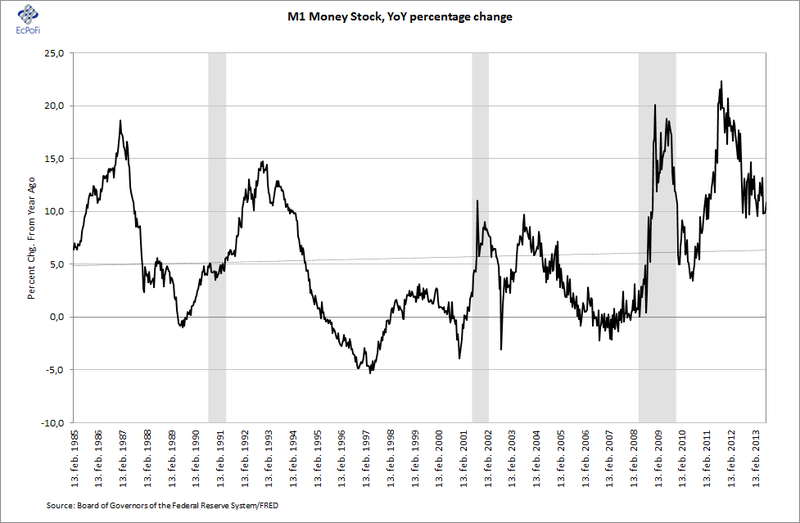 As a result, and to the extent that money supply drives stock market prices directly (more money chasing the same number of shares) and indirectly (through an artificial lowering of interest rates), future (short- to medium term) expected stock market returns should be lower (in nominal terms) than they would have been had banks instead lent out more of the excess reserves. 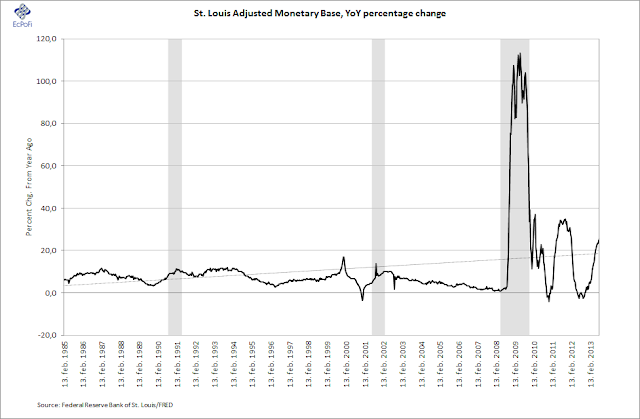 I must here highlight that growth in money supply and credit not backed by a commensurate amount savings, especially the aggressive sort, only serves to create booms and busts as credit expansion and money supply growth must eventually end and contract (the currency and the monetary system would collapse otherwise). Over a short or medium term period however, credit expansion can indeed help drive stock prices up significantly (e.g. 90s and 00s). 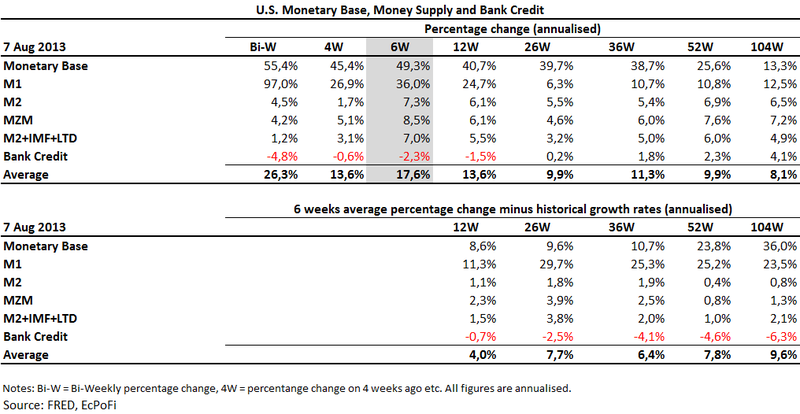 The M1 money supply is still expanding quickly, growing 10.8% for the bi-weekly period ending 7 August compared to the same period last year. It is however growing less than the average year on year (YoY) growth rate of 11.6% seen during the last 52 weeks. 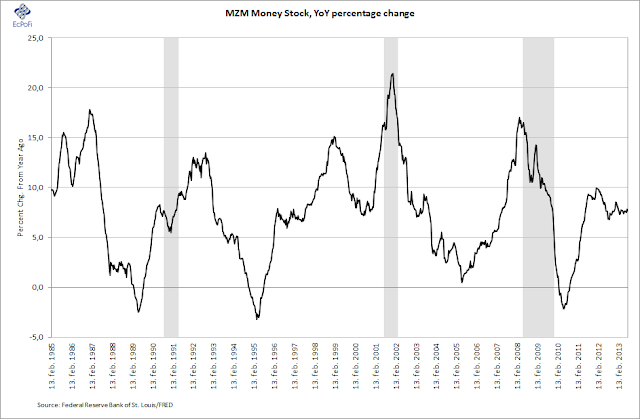 The M1 is also growing less than it did in 2011 and substantially less compared than the 2012 average YoY growth rate of 15.1%. The growth in the M2 money supply appears to follow a similar pattern to that of M1 and in recent weeks the YoY growth rate has been fairly stable around 6.9%. 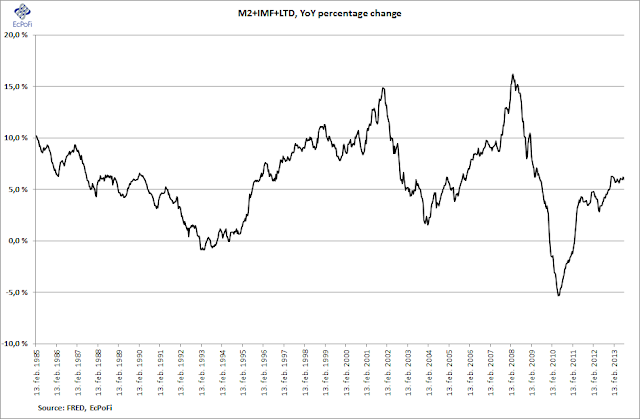 As with the M1 however, this is substantially less than the average YoY growth rate of 8.5% in 2012. Year to date, M2 has only increased by 1.6% which is very low compared to what we've seen in recent years. 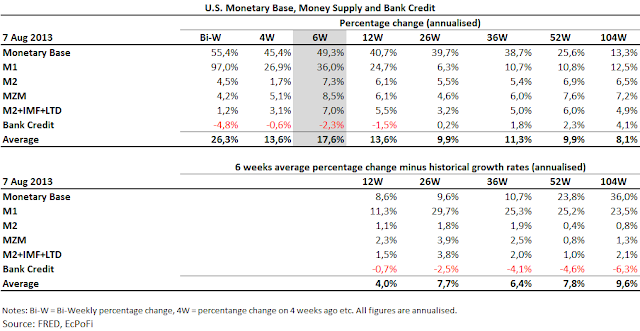 The broadest measure of money supply in this report, the M2+IMF+LTD, is the only money supply measure with a trend growth higher than the average for the last three years. This has largely been driven by a 5% or higher YoY growth rate in Large Time Deposits (LTD) for the last six bi-weekly periods, although Institutional Money Funds (IMF) has also started expanding this year following more than three years of declines. 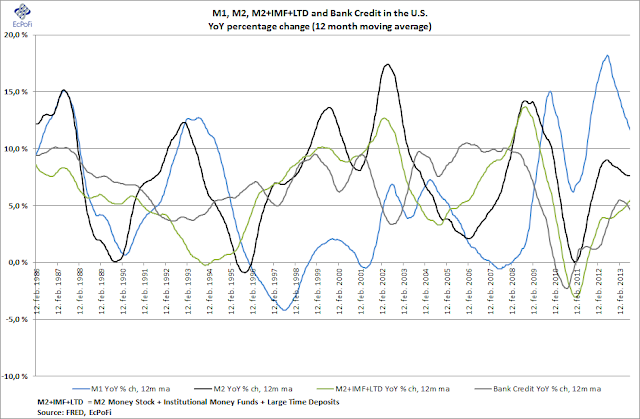 Although bank credit is still expanding on a YoY basis, the growth rate is tumbling. At 2.3%, the growth rate for the week compared to last year was the lowest since the bi-weekly period ending 14 December 2011 (when it hit 2.2%). Year to date, the total value of bank credit outstanding is only up by 0.4% since the end of last year. 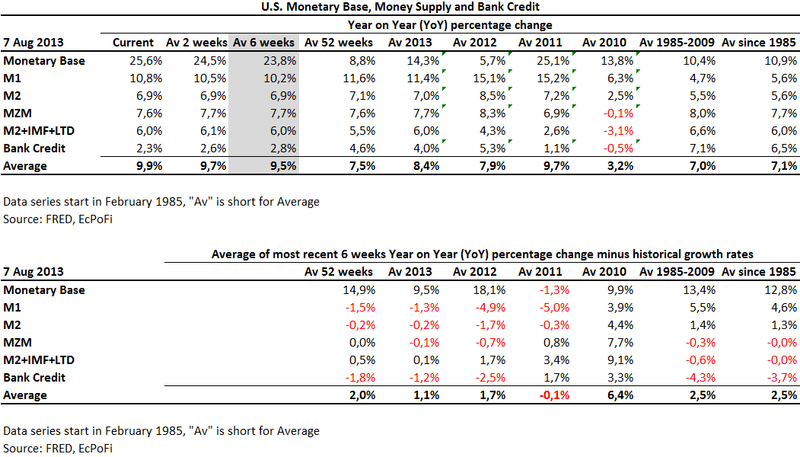 Little new net credit has therefore been granted this year by banks in the U.S. When banks issue credit, e.g. granting a loan, a deposit is generated. As a deposit is classified as money, credit expansion increases the money supply. The declining growth in bank credit has therefore lead to a slowing down in the growth rates for both the M1 and the M2 money supply as well. 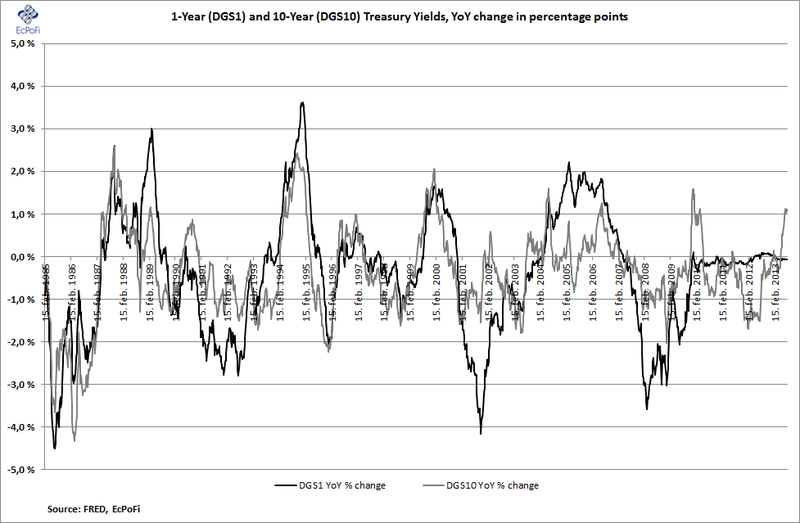 As discussed above and in previous reports, the 10-year treasury yield has increased substantially in recent months on tapering talk. So far this year, this yield has increased by 95 basis points while the spread between the 10-year and the 1-year has increased 99 basis points to 2.59%. 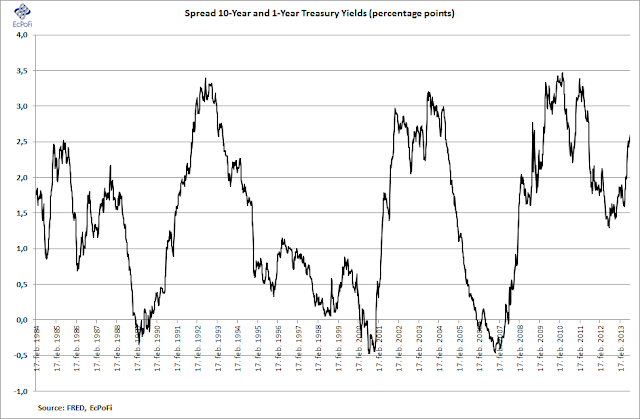 This spread is now 112 basis points higher than the average since 1984 of 1.47%. The yield curve has hence steepened. At least for now, this appears to have had little or no impact on the market valuation of the S&P 500 index. 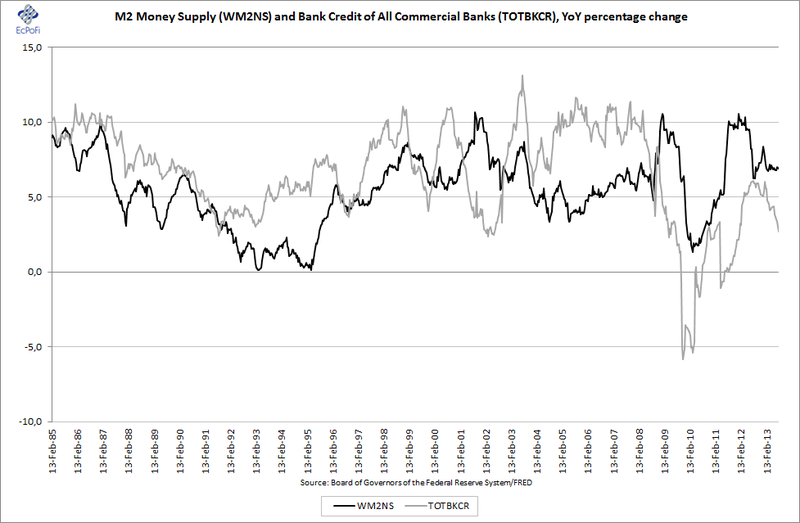 But it could do going forward, together with the decline in the growth rates of credit and money supply.